Guests at Colonial Pines Inn on Thanksgiving are usually going out for a sumptuous holiday feast served at one of Highlands’ fabulous restaurants. 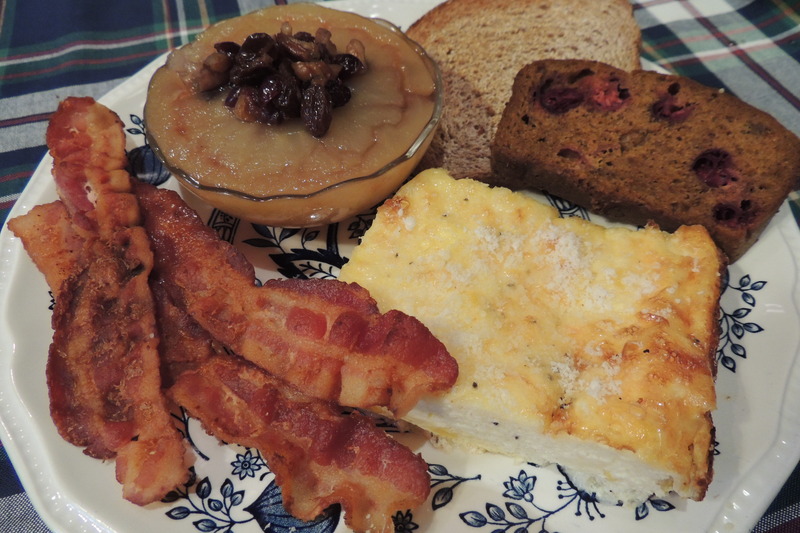 Since the only other meal that day will be breakfast, I like to serve something especially hearty like this White Cheddar Flan, crispy bacon, Pumpkin-Cranberry Bread, Apples-in-a-Dish, and whole-grain toasted bread from Annie’s Organic Bakery. White Cheddar Flan is a creamy, cheesy crustless quiche and the original recipe was in Yankee Magazine’s “Main Dish Church Supper Cookbook,” published in 1980. To serve eight, you can make my version a day ahead in a 9X13 pan. See previous posts for the bread and apple recipes which can also be made ahead. In the morning, pop the casserole into the oven, fry up the bacon, warm the apples and serve. Easy as pie! Spray 9X13 baking pan with cooking spray. Layer half of corn and half of cheese in pan. Repeat layers. Mix eggs, half-and-half, salt, pepper, nutmeg, & cayenne pepper, beating well. Pour over eggs & cheese. Dot with butter and sprinkle with parmesan cheese. Bake at 325 about 55 minutes until puffy and lightly brown. Serve immediately. HAPPY THANKSGIVING from Donna & Chris Alley!